Now in its 25th year of operation and under wholly-independent ownership following a management buyout, UK charter carrier Titan Airways has consistently been a solid and reliable performer in the air transport sector. The business has an enviable record of profitability, growing by over £300,000 year on year. Despite the huge challenges seen in the aviation sector, Titan Airways profits have grown from £1.8 million pre tax in 2004 to £7.6 million in 2012. Such is the company’s success, that it has been included in the prestigious Times Profit Track 100 on four occasions. This summer the carrier has boosted its activities with the arrival of a first Airbus A320 which it has been offering on ACMI lease deals. The aircraft entered service in late April initially on contract work for Dutch carrier Transavia and has already been signed-up to a medium term wet-lease contract which will see it flying for Jet2.com until mid-September after which the 168-seat jet will be available for further airline sub-charter requirements and a whole range of other charter opportunities. The new addition is an important one for Titan being the first step in its long-term strategy which aims to introduce more modern, economical and environmentally friendly aircraft into the fleet. The A320 product line is a popular choice for a host of airlines worldwide and therefore Titan anticipate strong demand for the new aircraft from other airlines for wet/damp lease and airline sub charter alongside the ad-hoc charter and tour operator charter work. “All the aircraft in the A320 family, which comprises the A318, A319, A320 and A321, are economical to operate, with improved fuel burn and carbon emissions. Plus, many of the components and systems are interchangeable so maintenance costs can be reduced even when operating more than one type of aircraft. In addition, all the aircraft in the A320 line are equipped with the same cabin/flight deck management system, so crew are able to switch between aircraft types and savings can be made with regard to training,” Alastair Kiernan, Commercial Director, Titan Airways told The HUB during an interview on the sidelines of this year’s Routes Europe event in Budapest. Alongside the A320 contract, Titan is offering a robust summer programme of flying to support independent niche tour operators with their air service requirements. The airline will be operating a variety of routes this summer on behalf of a diverse mix of tour operators including: flights to Bergen for Norwegian cruise specialist, Hurtigruten; flights to Calvi on behalf of niche tour operator, Corsican Places; flights to Lourdes for pilgrimage tours experts, Tangney Tours; and flights to Dalaman with upmarket Turkey specialist Exclusive Escapes, who offer boutique hotels and luxury villas with pools on the unspoiled Lycian Coast. The Tangney Tours, Hurtigruten and Corsican Places’ flights will be operated by Titan Airways’ Boeing 737-300 aircraft with 130 seats, while Exclusive Escapes’ flights will mainly be operated on Titan’s 757-200 with 202 seats. Exclusive Escapes is taking advantage of the versatile variable geometry seating on the 757 in order to offer its customers a premium service. Every row of seats on the aircraft converts at the touch of a button from six abreast to four abreast with a drop down central table and Exclusive Escapes have opted for a split standard/club class cabin with 10 rows in the four abreast configuration on their on flights to Dalaman. Building on a strong performance in the summer market, Titan is also expecting to increase its volume of charters operated on behalf of ski tour operators for winter 2013/2014. It has previously operated winter ski charters on behalf of a number of leading UK ski tour operators including Crystal Ski, Thomson Ski, Club Med, Esprit Holidays and Inghams. “In addition to our established London Stansted based ski flight programme, and in response to demand, we are looking at increasing operations from London Gatwick for the winter season,” Kiernan confirmed. Titan Airways has grown during its 25 year life from a staff of just two on day one to a workforce of around 270 people. It has become an established player in the European charter market, providing a bespoke charter tailored to each client’s demands, catering for individuals or groups from one to 265 passengers and its clientele list includes national and regional airlines, cruise lines, pop groups, blue chip organisations, finance houses, major car companies and tour operators. The carrier now operates a versatile fleet of 12 aircraft, ranging from a six seat Citation CJ2+ to a 265 seat Boeing 767-300ER several of which aircraft are QC ‘Quick Change’ variants that can be quickly converted for either passenger or freight transportation. The airline has built a strong industry reputation through its ‘Go Now’ policy, which guarantees that an aircraft can be airborne within 60 minutes of flight confirmation. 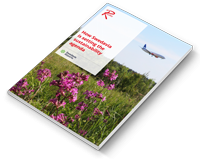 This is particularly popular with legacy carriers and regional airlines which sometimes require instant operational solutions after suffering an Aircraft on Ground (AOG) failure. The airline’s management team now has ambitions to further strengthen its position in the charter market and become a leader in the VIP, corporate travel, sub-charter and aircraft leasing sectors and Chief Executive Officer, Gene Willson, the founder of the business, predicts a positive future. He believes the airline’s success can be attributed to its ability to deliver bespoke services with exacting attention to detail to a diverse customer base. Willson recently completed the management buyout of the airline from investment specialist 3i, who had been involved in the carrier as a private equity backer for more than 20 years. Originally holding a 37 per cent stake in Titan’s parent company, Hagondale, 3i’s ownership was reduced to 22 per cent in March 2012. At the end of 2012, Hagondale purchased the balance of 3i’s shares, leaving Gene Willson, who still regularly captains several of the aircraft types in the Titan fleet, as the sole shareholder. “3i have been a very supportive partner but completing the purchase of their shares provides us with full control of our long term development plans for the airline. The additional shareholding also gives us the flexibility for further business opportunities,” he said.